The 49er RV Ranch is a destination campground located in the foothills of Gold Country between Yosemite, Lake Tahoe, and Sacramento. 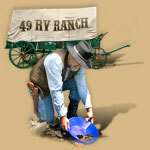 Whether this is your first experience at the 49er RV Ranch, or another of many, venturing out into our local and surrounding areas, provides a taste of the wonderful flavors and cultures that are so abundant in the Sierra foothills. The Ranch is proud to guarantee twice as much to enjoy as you have time for. History abounds in the nearby Mother Lode communities of Sonora, Columbia, Jamestown, Murphy’s, and you can celebrate Mark Twain’s famous Jumping Frog of Calaveras County in Angels Camp. Plan a day trip to Yosemite National Park, breath taking Lake Tahoe, or California’s State Capitol of Sacramento.